Andrea Reedy sent in this one. 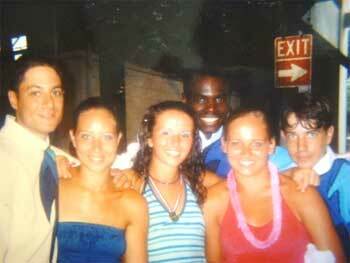 "This picture is of me and five of my friends at Division II & III Finals in 2003. We were all with the Lehigh Valley Knights in 2002 and then moved on together to Jersey Surf in 2003. We are (from left to right) Trevor Santora (bass), me (guard), Rachael Hyde (guard), Devon Jackson (contra), Allee Phillips (guard) and my brother, Ricky Reedy (baritone). Only three of us went on to march with Jersey Surf in 2004 (Trevor, Ricky and I)."